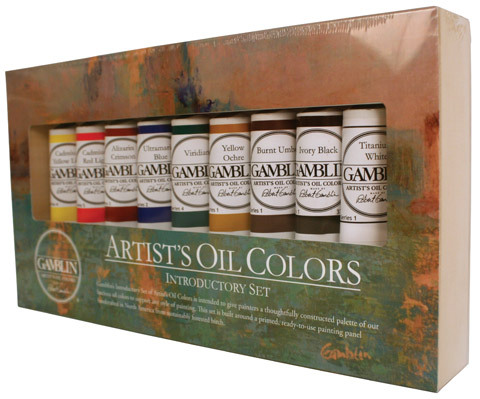 Gamblin's Introductory Set of Artist's Oil Colors was designed to give painters a thoughtfully constructed palette of luscious oil colors to support any style of painting. This set is built around a primed, ready-to-use painting panel handcrafted in North America from sustainably forested birch. The set contains one each of nine colors in cadmium yellow light, cadmium red light, alizarin crimson, ultramarine blue, viridian, yellow ochre, burnt umber, ivory black and titanium white in 37ml tubes. The primed, cradled panel measures 12.25" x 6.5" x 1.75".